Long before we were flinging angry birds to their deaths by the millions in the name of giving those rascally pigs a bad day, we were sacrificing innocent lemmings in the name of solving puzzles. PC gaming classic Lemmings challenged players with guiding an army of the suicidal rodents to safe haven, a process that usually involved blowing up, drowning, or in some other way terminating a smaller handful of them. Totally a “needs of the few outweigh the needs of the many” situation. Thanks for the wisdom, Spock. Lemmings Touch is coming to PlayStation Vita on May 27, and we got a final look at what developer d3t Ltd. cooked up for the enhanced remake at a recent Sony preview event. The studio rebuilt the game from the ground up, adding in a new Candy Land environment and bringing the level total up to 100. The graphics have also been completely reworked with hand-drawn art and, as the title suggests, touch controls are a big part of the game. Let’s step back. The whippersnappers among you might not be familiar with a game series that hasn’t been popular since the 1990s. Each level in the game amounts to a single puzzle. A finite number of Lemmings pour out of an entry location — you can change the rate that they appear, but you can never stop the flow completely — and march in a straight line until they hit an obstacle, at which point they about-face and march off in the opposite direction. If there’s no obstacle between them and, say, a deadly drop, the mindless rodents will march right over the edge to certain doom. You can’t control the lemmings directly, but you can assign roles to individuals, such as climber (to scale vertical surfaces), digger (digs directly downwards), or floater (uses an umbrella to survive deadly falls), to circumvent various obstacles. You’ve only got a limited number of roles to assign in each level, however, so finding a solution is often a matter of getting a few lemmings out to a location where they can help everyone else. That’s pretty much the way things work in Lemmings Touch, albeit with a few new wrinkles. Mischievous Lemmings require a rethinking of how you approach a given level, since it’s game over if even one of them makes it to the exit location. Their red hairdo is easily spotted, and you’ve got to make sure that you kill each and every one of them off before your horde makes its final beeline for the exit. You’ve also got the aforementioned touch controls, which utilize the PlayStation Vita’s front-facing screen to provide more immediate access to in-game commands. 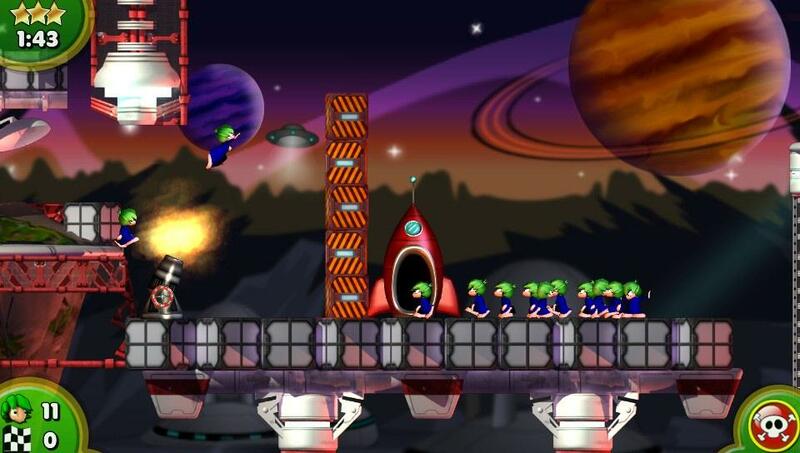 Certain glowing objects can be physically manipulated with a touch or a swipe, such as shifting platforms, adjustable cannons, or the lever that manages how quickly new lemmings drop into the level. There are also control stations that lemmings can interact with in order to create a button you can then tap for level-specific purposes (such as opening/closing doors). Of course, you can also use touch controls to interact with your lemming army directly. Tap one of the little rodents and a small menu pops up on the screen that allows you to assign one of your available jobs. Simply tap the desired job, and the chosen lemming instantly transforms. It’s a simple, intuitive process that immediately makes sense once you start playing with it. Lemmings Touch also features some dangling carrots in the form of unlockable cosmetic customization options that allow you to personalize your lemming army. Throughout the game, you unlock global objectives, like creating X number of builders, that award you with coins. Complete one and another takes it place. Any coins you earn can then be spent on customization items. 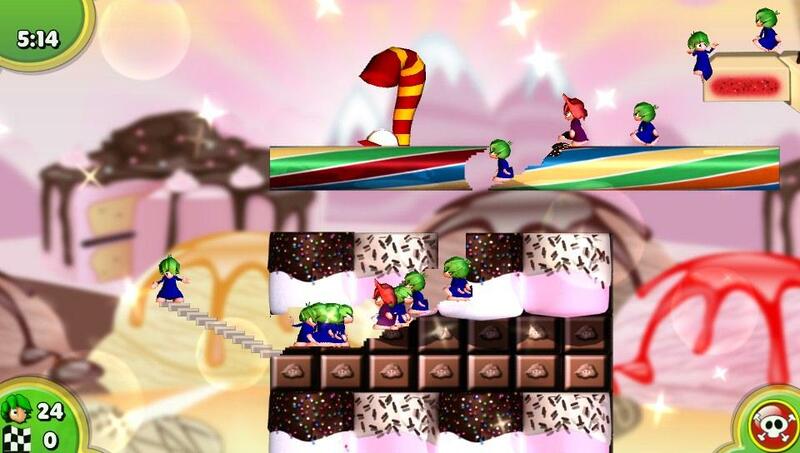 As remakes go, Lemmings Touch is just about as straightforward as they come. It also appears to be a quality effort from d3t, one that captures the spirit of the original game while expanding on the core ideas in clever, platform-specific ways. We’ll see for ourselves soon enough; Lemmings Touch is set to arrive for PlayStation Vita on May 27.